Dan McNamara was standing in his shop in Southern California trying to come up with a name for his new boat-building venture when he looked up on the wall and the proverbial light bulb in his head flashed. That poster was of Betty Cook’s national championship-winning 38’ Scarab, Kaama, which was the first boat in that size drafted by legendary designer Larry Smith. McNamara and his business partner Lance Ware have been working with Smith since about 2008, licensing bottom designs from the Santa Barbara-based designer. Kaama Sport Yachts has the rights to Smith’s 38’, 43’ and 46’ twin-stepped V-bottom designs. The new Kaama Sport Yacht models are all five feet longer because they have an extension to house the rudders for the ZF Trimax surface drives. 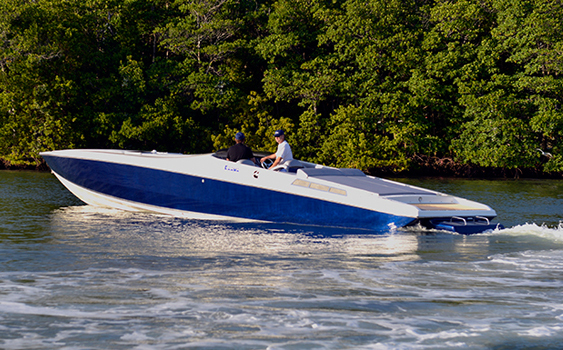 The company also builds the Speedster series of gasoline-powered boats including a cool 32-footer based on a Cougar V-bottom that McNamara campaigned on the offshore-racing circuit. They also own the rights to Smith’s 26’ single-engine design. McNamara and I both drive the most successful racing version of that boat, Nigel Hook’s Archer Marine Services, when it competed in the Offshore A class in the early 1990s. A pleasure version of that boat has always been my dream and it would be a great fit on my home lake. Speaking of the hull designs licensed from Smith, McNamara said, “They’re all based on national-championships-winning boats.” The company’s plan is to build diesel-powered performance boats that deliver “90 percent of the performance” that gas power would in as bulletproof a package as possible. McNamara and Ware went with the Trimax drives, which were designed by Fabio Buzzi, because they are nearly indestructible and they are fixed, which means the boat steers with rudders instead of re-directing the drives’ thrust. Kaama Sport Yachts also uses Buzzi’s trim tabs because all the mechanisms and hydraulic pumps are housed inside the hull to prevent corrosion in saltwater environments. Just as we were removing the docklines, longtime powerboat racer, enthusiast and friend Rick Bowling arrived and asked if there was room for one more. He hopped on and McNamara fired up the motors. The reaction from those around the docks was great. Instead of the roar of big-block gasoline engines, we heard the quiet of twin 550-hp Cummins diesels mated to the Trimax drives (so powered, the boat has a base retail price of $649,000). The boat planed off easily and we were cruising at about 50 mph when one of the technicians from Cummins said something like “now check this out.” McNamara nailed the throttles and I was planted back against my bolster. The acceleration from the combination of the diesels and the Trimax drives was excellent. In our brief ride, the boat ran just past 80 mph and with the right props, McNamara and his partner Lance Ware hope to see 86 or 87 mph. In a discussion a couple of weeks after the show, McNamara and Ware said that the response to the boat at the show was excellent. Ware and McNamara are a pairing born out of the old Kaama surface drive. Ware was born and raised in Miami and he and his dad owned a Hustler 32LE with Kaama drives. They found McNamara, who was working at Archer Marine Services in Costa Mesa, Fla., who was known for his ability to keep Kaama drives working. Through their business relationship, McNamara and Ware became friends and in 2007, Ware sold a technology company and was looking for an investment. McNamara took for a couple of rides in the 48 LS and he decided to take the plunge. “We want to build a custom performance diesel boat for people that they can go out and enjoy for years maintenance free,” said Ware. And they get a boat with a legendary name. Check out both lines the company builds at www.kaamayachts.com and www.speedsterpowerboats.com. Eric Colby has spent the entirety of his 26-year career writing exclusively about the marine industry. He was the Senior Technical Editor at Boating Magazine and is a former Editor-in-Chief at Powerboat Magazine. Eric has won numerous awards in the Boating Writers International Annual Writing Contest and is a graduate of the Westlawn School of Yacht Design. A former offshore racer, Eric holds the “unofficial” title of fastest journalist on the water having run 172 mph in the 36’ Skater, Flight Club, at the 1000 Islands Poker Run in 2008.